A £2.5 million new affordable housing scheme by South Lakes Housing was unveiled on Friday 16th March 2018. 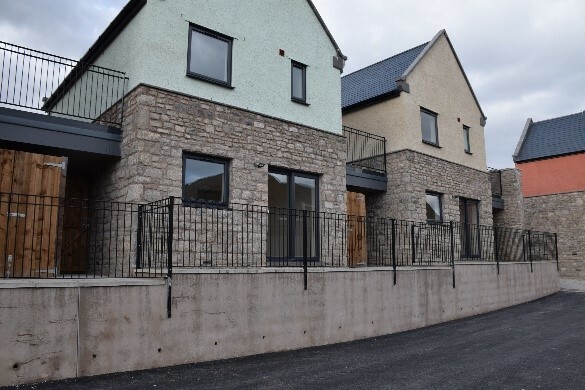 The 14 new affordable homes at Dowkers Lane in Kendal (comprising of 6 two bed houses, 4 three bed houses and 4 two bed flats) were built by Tyson Construction and designed by architect Halsall Lloyd Partnership (HLP). The homes were built on brownfield land previously occupied by garage blocks. The new development will help fourteen households that are amongst over 750 people waiting for accommodation of this type in the Kendal area. The affordable homes form part of a wider estate regeneration scheme which included the erection of bin stores and replacement storage sheds as well as environmental improvements such as new paths and alterations to service road. The blocks of garages had previously been the target for anti-social behavior and the plans were drawn up following extensive consultation with the community with the aim to ‘build pride in Waterside’. 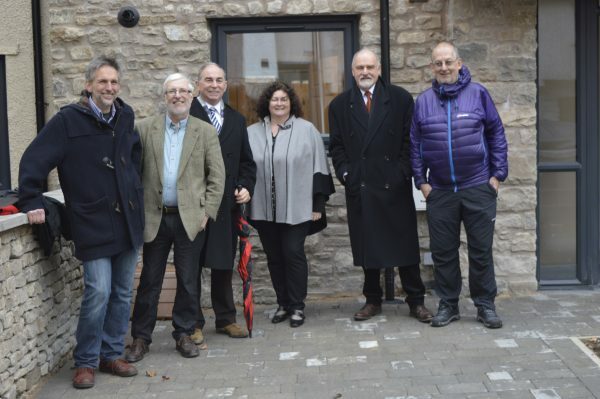 The £2.5M development was funded by South Lakes Housing, together with grants of £969k from South Lakeland District Council and £490k from Homes England. The rents are set at ‘affordable rent’ levels which means that they are up to 80% of market levels; this includes £124 per week for a 3-bed house and £106 per week for a 2-bed flat. Due to the restrictive nature of the site due its limited depth, an innovative design solution was required to provide amenity space for each dwelling. The design includes ‘roof-top’ gardens constructed over car port areas which provides residents with a fantastic vista of Kendal Castle and the Fells beyond. The homes were built with traditional materials including Lakeland stone which has been recycled from the demolished parts of the estate. SLDC’s Housing & Innovation Portfolio Holder, Jonathon Brook, said “SLDC have invested around £1 million into this scheme as part of plans to increase the number of affordable homes for rent by 1,000 by 2025. These new houses are of exceptional quality. It is great that these new homes are energy efficient and that recycled materials, such as Lakeland stone from the old site has been used in their construction”. RP Tyson Construction Director, Daniel Causer, said “We are delighted to have constructed this superb town centre affordable housing development in partnership with South Lakes Housing. Brownfield sites always present a particular challenge; but by working closely with the Architect, Engineer, South Lakes Housing and most importantly the local community, we have been able to deliver this superb new development, which we know will provide warm, safe, energy efficient homes for those in housing need. This is the first time we have partnered with South Lakes Housing and we hope to follow this successful project with many more”. The homes have been constructed using materials from sustainable sources and using high energy-efficiency products. These include the use of timber frame construction which is from a sustainable source, high levels of insulation, low energy lighting, high efficiency central heating boilers – all to reduce both fuel bills and the carbon footprint.